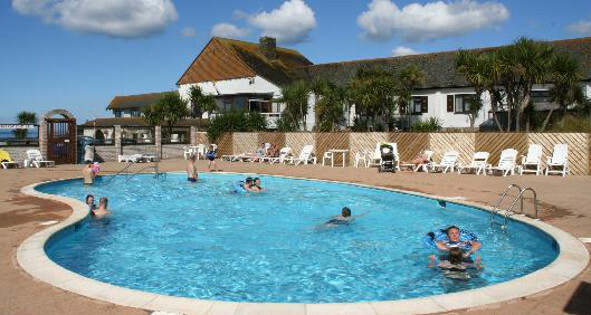 A holiday park in Cornwall with swimming pools is just the thing when you want quick dips and laid-back days spent away from the beach at St Ives Bay. Our large, outdoor, heated swimming pool allows for safe, warm, family bathing. Younger guests can enjoy the shallow paddling pool just yards from the main swimming pool. Both pools are found within the suntrap of our pool terrace, complete with sun loungers which are ideal for long summer’s days. Pool facilities are free to use for all self-catering accommodation and camping guests. Our pool facilities are open from 27th April to 13th September in 2019. Beachside Holiday Park may have its own private access to one of Cornwall’s best beaches but for when you’ve washed the salt and sand away and want to relax in comfort, our swimming pool is where you will find yourself basking on a sunlounger and sipping a cool drink. The outdoor pool is ideal for families where you can keep an eye on your children while they enjoy the clear water and the joys of playing by the pool.